Brick Knight is up for pre-order now. This sounds AWESOME! I'm all over the RxH. Guessing the Glyos Synth will likely be a Pheyden, being that he's kinda the face of Glyos, that or Sarvos or both...two heads why not! Looking forward to it either way. So hey, does anyone here have a Synthetic Human? I'm curious as to how they hold up, are they sturdy and well built. They look pretty amazing and I've been thinking about picking one up, guess I will now. Robotimms wrote: This sounds AWESOME! I'm all over the RxH. 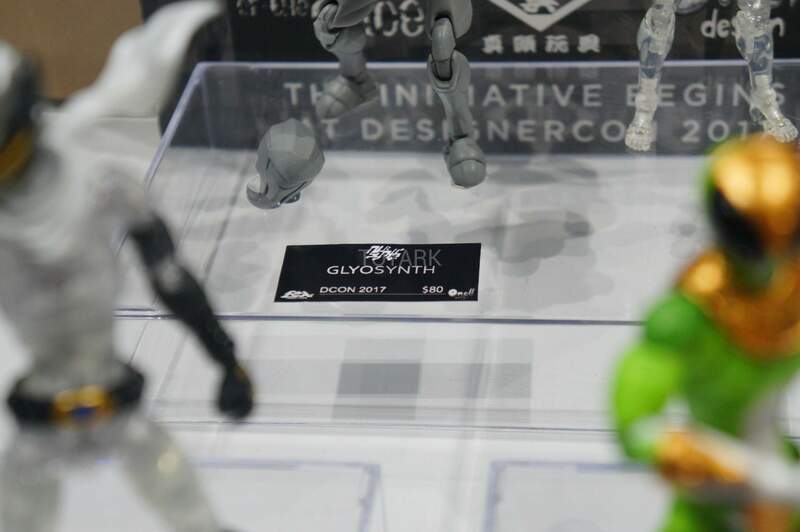 Guessing the Glyos Synth will likely be a Pheyden, being that he's kinda the face of Glyos, that or Sarvos or both...two heads why not! Looking forward to it either way. I saw this via Toy Pizza reposting D-Amazing's pics. I think it's something new unless it has a connection to the drop later this month. Delphi helmet? 1.) Holy crap, that is ridiculously awesome. 2.) If I didn't know better, I'd say that the head actually looks a little like how we've seen the Phase Arm piece when it's used as a head, and based on that cannon on the left arm and the armor piece, the figure as a whole kinda reminds me of this build. 3.) Do you guys think this will have the NuSynth skull underneath like other releases, or something unique because of the Glyos connection? kranix wrote: 1.) Holy crap, that is ridiculously awesome. Totally agree. Can't wait to see it in color. kranix wrote: 2.) If I didn't know better, I'd say that the head actually looks a little like how we've seen the Phase Arm piece when it's used as a head, and based on that cannon on the left arm and the armor piece, the figure as a whole kinda reminds me of this build. The head definitely favors the phase arm piece. It also favors other existing heads like the reverse side of the Glyan head and the alternate Buildman head. The shapes of the blaster arm shown do have the shapes of the other phase arm pieces. The chest favors the Glyarmor and the feet are kinda an amalgamation of the Glyan foot and the Buildman that has sectioned "toes". Hopefully some better pics pop up soon so we can make things out better. kranix wrote: 3.) Do you guys think this will have the NuSynth skull underneath like other releases, or something unique because of the Glyos connection? I sure hope it does, if not as an alternate interchangeable head would work for me too. A better look at the alt head. I suppose that's what a Neo-Sarvos or Glyninja head would look like in a realistic style. Are they actually selling these at the con? I don't think they're for sale, just on display. They're going to run $80 when they do come out. kranix wrote: I suppose that's what a Neo-Sarvos or Glyninja head would look like in a realistic style. Very Glyninja with that center slice down the middle of the face mask after the eye slit. It looks more like it's based off of the standard buildman w/ a few new mods here and there. Now that you mentioned it, the head does look a bit like the base of a phase arm. The alternate head could be a re-incarnated ! I think it looks like some of the Ranic Buildman concept work. Check out the alt head and phase arm attachment in the second post. Also looks like its got some Glyarmor on and that Neo Sarvos head is sweet. Can't wait for this and the RealxHead figures! Well, that's quite the picture. It's definitely Glyarmor, and from that angle, the second head is very much a Glyninja-inspired sculpt. It still looks like the first head is a Phase Arm piece, but I could see how others might take it to be an old Ranic head, too. After August 3, I hope we start getting some information about what the story is behind this collaboration! 1000toys has released a teaser video for the three Glyosynth figures: Pheyden, Buildman and Glyninja. The description also confirms that the figures will possess some some degree of Glyos compatibility. I'm assuming more details will be revealed at DCon. Holy crap these are fantastic! Hopefully these won't be that hard to get, I'd assume that Matt will have them in the store. That red Buildman is sick, I'd like to see Matt release an Argen in these colors like he did the Neo Standard Pheyden in wave 74. Love how the Glyninja has "realistic" looking glyan blasters. Hopefully these sell well and we see more from the line... Gobon, Sarvos, how about a Mushi! Yes! Can't wait for these. Very cool to see alternative takes on the Pheyden, Buildman and Glyan designs. Ordered a Pheyden, cant wait. I think i may try making some sort of pouch belt for him... seems like he should have one, and that belly button freaks me out a little. Just seems odd for an inter dimensional traveler. Was Pheyden born, why would he have one otherwise? I’d rather not think about it lol. Needs a belt. Had a hell of a time getting the normal left arm on for some reason, but in general I love this. The proportions are a bit more female looking, which is a little weird for a Pheyden, but it depends how you pose it. Again i think a pouch belt would help. I kinda wanna make a GITD head and phase arm now..